It's a patented concept for container handling. 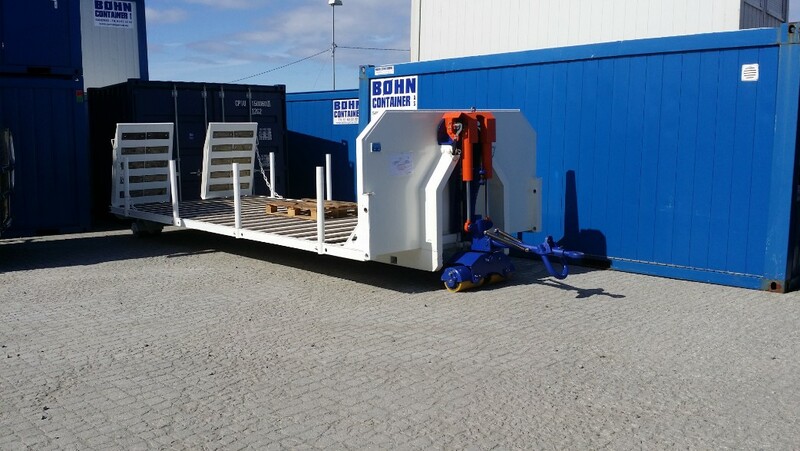 Unlike traditional ISO shipping container corner casters, this new invention is suitable for both shipping containers and hook lift containers and hence the market potential for this solution is twice the market of the traditional shipping container corner casters. In addition to be much more versatile than traditional corner casters it also handles the containers much better on uneven surfaces, and if that were not enough then there is no time-consuming assembly like traditional corner casters requires. The containers are ready to roll in the same second the hook loader has unloaded them. This concept is patented in many countries already and can be licensed. Exclusive rights for specific regions or worldwide available. It is a very interesting case for the Heavy Equipment attachments manufacturing industry. It's a new solution that could roll your business a great step forwards and it could be exclusive in many years to come for your business only. Jack-Pack AS is introducing a new patented invention into the hook-lift/roll off container handling system that will increase the application areas for these containers by up to 20 %. The Jack-Pack container mobilizer attachment will add much more versatility and value to your hook lift/roll off bodies and it will for sure help you with completing your project on budget. A third and simplyfied version with Ø 500 mm diameter compact rubber wheels rated at 5400 kgs each are now on the doorstep. 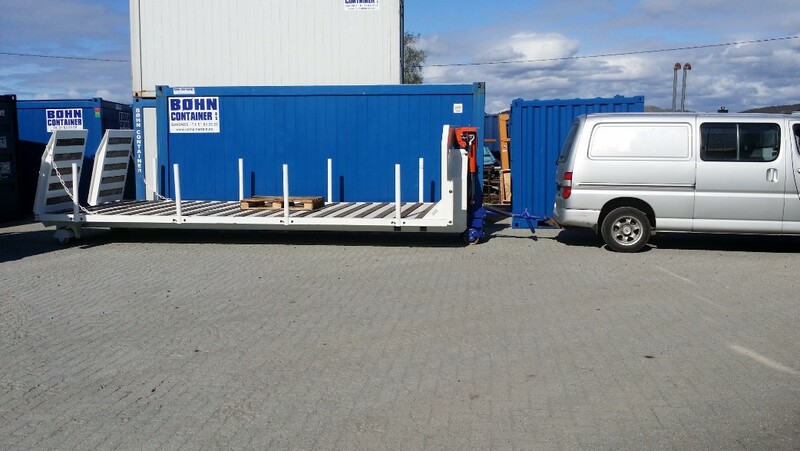 That will allow for a container total weight of 21600 kgs. (47620 pounds). Speed is limited to 25 km/h. It's not for highway use. Please have a look at the short demo video below, this video shows our second prototype with simple rubber coated steel rollers. Attach the dumpster directly to a telehandler and it will move with the machine. Here in a tree cutting operation and as you can see the tree branches fall directly in to the bin. Here is an image of the version with rear twin rubber wheels. This wheel set is pendeling as well. 20' ISO shipping containers fits directly to a hook lift skeleton frame. 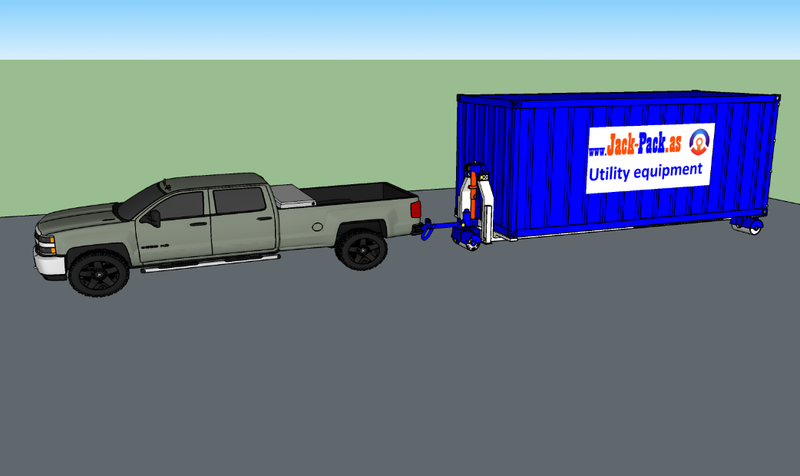 With Jack-Pack you can now haul a shipping container around on a worksite with your pickup truck. You can even make it a train with multiple containers in a row. Our solution fits perfectly for uneven surfaces, which competing solutions do not. You can clearly see the problems with the fixed corner casters on the container in the middle of this animation. One wheel is way up in the air, and this will always be the case with this excisting solution when the surface is uneven. Have thoughts about the Jack-Pack container caster solution? Please add your comment below.